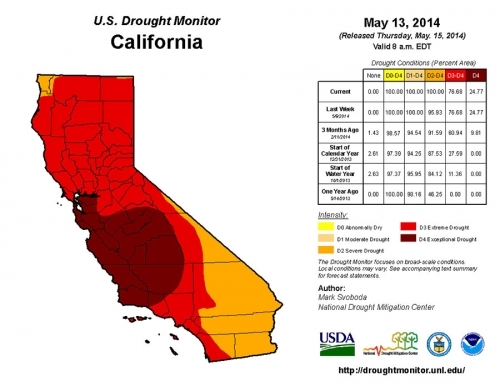 It might not seem possible, but California's drought just got worse. According to Thursday’s release of the U.S. Drought Monitor, 100 percent of the state is now in one of the three worst stages of drought. As of May 15, California was completely in the three highest stages of drought, severe, extreme and exceptional. The latest report, which indicated that rain had improved conditions in parts of Texas and the Plains states, revealed that California got no relief. In fact, a heat wave likely worsened the impacts of the drought in the state, including the wildfires that flared up this week. The drought in California, which has been building for the past few years, really took hold this winter. December-March is supposed to be the region’s wet season, but this year turned out to be a bust. At the beginning of April, nearly all of the state was in a drought — nearly 70 percent was in “extreme” or “exceptional” drought, the two highest stages. By the end of the month, the entire state was experiencing at least some form of drought in what has been the driest start to a year in California on record. “Things are not trending in the right direction,” Mark Svoboda, a scientist at the National Drought Mitigation Center, told Climate Central. This week, the situation became worse, with 100 percent of the state now in the three worst stages of drought. It's the first time that has occurred since the inception of the Drought Monitor in 2000. Exceptional drought, the highest stage, runs from Los Angeles to San Francisco and inland to the foothills of the Sierra Nevada mountains. A heat wave that descended on the state this week, sending temperatures into the triple digits and setting records in some places, is likely to only make matters worse. “The heat will exacerbate and accelerate the impact concerns that come with higher demand (for water) and increased fire risk during such heat waves,” Svoboda said in an email. Since Wednesday, seven fires have broken out between San Diego and San Clemente, their smoke plumes visible by satellite and radar. The risk of wildfires increases because the hot, dry conditions help dry vegetation that can act as fuel for the fires. Gusty winds can, in turn, increase the odds that those fires spread. The stages of drought across the contiguous U.S. as of May 15. About 38 percent of the country was in some form of drought, mostly concentrated in California and the Southern Plains. The situation in California is unlikely to improve or change much over the summer, which is the dry season for most of the state. Officials are hoping that an El Nino that is expected to develop this summer will bring the return of rains in the cooler season and alleviate water woes. 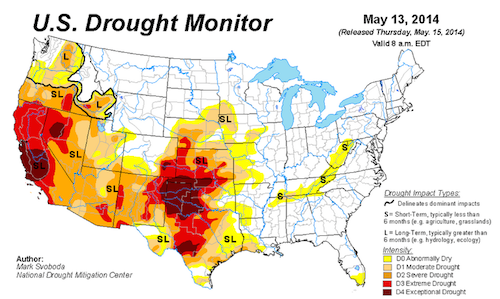 California isn't the only dry part of the U.S. Another major drought spanning the panhandles of Texas and Oklahoma, as well as parts of Kansas, Colorado, and New Mexico is also still firmly in place. “Drought is really intensifying pretty rapidly in the Southern Plains,” Jake Crouch, a climate scientist with NOAA's National Climatic Data Center, told Climate Central. The first 4 months of the year in Oklahoma were the second driest start to the year on record for the state, Crouch said. The only drier year was 1936, during the Dust Bowl. Rains that fell earlier in the week did beat back the drought in the eastern portions of Texas, but the drought was not nearly as intense there as it is in the western and central portions of the state. “East Texas is an interesting case as it has been the area that has literally been ‘sitting on the fence’ each of the past two falls,” Svoboda said. He said the region has been going through cycles of rainy fall and winter weather that have kept the more severe drought seen in the Panhandle and West Texas at bay. The recent rains will only bolster its defenses. Heavy rain also fell in Nebraska and parts of Kansas, with some improvements seen in both of those states as well.